On the 30th (Mon), take in the views from Ram Jhula and then relax and float downstream with a rafting and tubing tour. Get ready for a full day of sightseeing on the 1st (Tue): contemplate in the serene atmosphere at Triveni Ghat, admire all the interesting features of Omkarananda Ashram, and then take in the spiritual surroundings of Shri Badrinath Ji Temple. To find other places to visit, maps, more things to do, and other tourist information, read Rishikesh online trip itinerary builder . New Delhi to Rishikesh is an approximately 2.5-hour flight. You can also drive; or take a train. Wrap up your sightseeing on the 1st (Tue) early enough to drive to Haridwar. Kick off your visit on the 2nd (Wed): admire the natural beauty at Swami Vivekanand Park, take in the spiritual surroundings of Har ki Pauri, and then take in the spiritual surroundings of Ganga Aarti at Haridwar. Here are some ideas for day two: contemplate in the serene atmosphere at Chandi Devi Temple, then contemplate in the serene atmosphere at Kamraj-ki-Kali Temple, and then contemplate in the serene atmosphere at Adhbut Temple. For traveler tips, more things to do, other places to visit, and tourist information, go to the Haridwar holiday planner. Haridwar is very close to Rishikesh. Wrap up your sightseeing on the 3rd (Thu) early enough to travel to Mumbai. Mumbai is known for historic sites, scenic drive, shopping, nature, and theme parks. 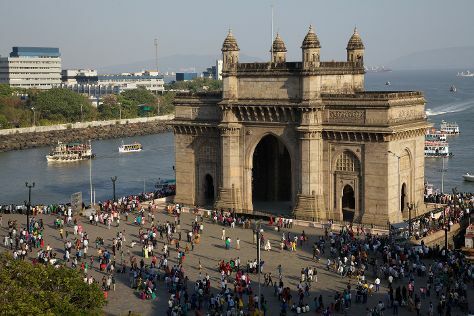 Your plan includes some of its best attractions: pause for some photo ops at Gateway of India, make a trip to Dhobi Ghat, take an in-depth tour of Chhatrapati Shivaji Maharaj Vastu Sangrahalaya, and take in the spiritual surroundings of Shree Siddhivinayak. To see where to stay, traveler tips, reviews, and tourist information, refer to the Mumbai road trip planning site . Traveling by flight from Haridwar to Mumbai takes 5 hours. Alternatively, you can drive; or take a train. In October in Mumbai, expect temperatures between 39°C during the day and 28°C at night. Finish your sightseeing early on the 6th (Sun) so you can travel back home.